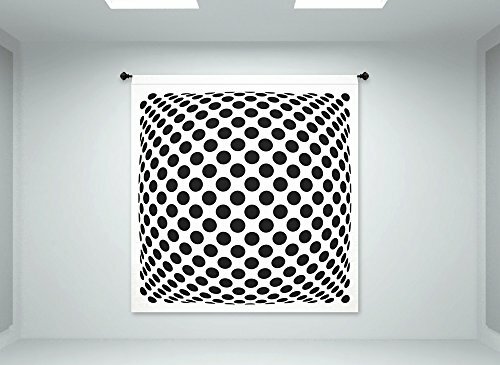 Wonderful Op Art illusion on a hanging fabric panel. Inspired by the large wall mural seen in Roger Sterling's office at Sterling, Cooper, Draper, Pryce on AMC's "Mad Men" series. Vertigo Creative Products' beautiful fabric wall panels are 100% polyester, 9oz, three-layer woven stitch-hemmed fabric. They are wrinkle resistant, durable and machine washable. A 3' pole pocket is built-in at the top for hanging on a rod. NOTE: NO HANGING HARDWARE IS INCLUDED. 100% polyester, 9oz, three-layer fabric - fully hemmed. If you have any questions about this product by Vertigo Creative Products, contact us by completing and submitting the form below. If you are looking for a specif part number, please include it with your message.